NO CRASH PRE-WORKOUT now in a convenient, perfectly portioned packet. Easy to throw in your gym bag for the ultimate recovery. 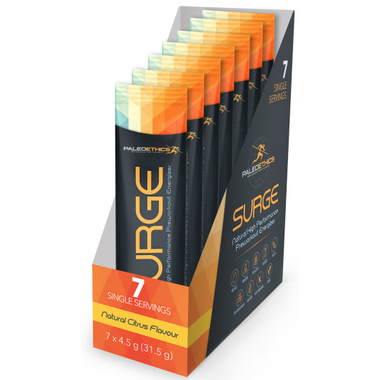 CLEAN ENERGY: Surge is a no-nonsense formula containing energizing ingredients that come exclusively from all-natural sources, without the addition of any fillers or heavily processed substances. This translates to a healthier boost in energy without the unpleasant side effects – no jitters, bloating or restless nights – just the clean energy you need to perform. MENTAL FOCUS: Because Surge doesn’t contain any caffeine or processed additives, you won’t experience any anxiety, distracting thoughts, or a racing mind. Naturally replenishing and energizing ingredients mean you can look forward to a clear mind and a focused workout. NO CRASH: Say goodbye to the restlessness, heart palpitations and upset stomach that often come with highly caffeinated supplements. Say hello to clean, long-lasting and crash-free energy. Thanks to ingredients like ginseng, this blend will give you a natural energy boost while still allowing you to feel relaxed after your workout. Directions: Mix 1 packet with 10-12 ounces (295-355 ml) of water and consume prior training.